The one constant in President Donald Trump’s otherwise erratic speeches as a presidential candidate was his promises to deliver jobs to American communities. In his inaugural address, he promised to create 25 million new jobs over the next decade, a wildly implausible claim. Since the presidential election, plans for creating jobs have proliferated. Senate Minority Leader Charles Schumer (D-N.Y.) has proposed an extra $1 trillion in infrastructure spending over the next decade and has put the job-creation element of the plan front and center. The Center for American Progress (CAP) put forward a “Marshall Plan for America” (Tanden et al. 2017) aimed at boosting job opportunities (particularly for those without a four-year college degree). Outside the Beltway, the idea of government directly providing paid work to all willing workers—a job guarantee—has been gaining steam. Paul, Darity, and Hamilton 2017 and Tcherneva 2012 are recent examples of academic treatments of the job guarantee, and Spross 2017 is a useful popular overview. On one level, this emphasis on the government’s role in job creation in recent years is a bit of a puzzle. After all, the U.S. economy has created jobs at a pretty respectable clip for most of the past eight years: December 2017 marked the 87th month in a row that has seen private-sector job creation, with a cumulative 16.6 million jobs created since the recession’s trough in June 2009. Further, the unemployment rate has been cut by more than half since its Great Recession peak, and in December 2017 it sat at a level not seen since 2001. We need to maintain aggregate demand at levels consistent with macroeconomic full employment. The most important task facing policymakers is ensuring that aggregate demand (spending by households, businesses, and governments) at the national level is high enough to support maximum sustainable levels of employment (or macroeconomic full employment). This aggregate demand management is the task of macroeconomic policy—specifically, fiscal, monetary, and exchange rate policies. If aggregate demand is too low, no other job creation strategy can work at scale until the shortfall is fixed. We need to make sure the resulting job growth is widely shared. Complementary policies should be enacted to ensure that the maximum sustainable level of aggregate demand nationally is spread as widely as possible across workers, regions, and communities. To make a given level of aggregate demand as “job-intensive” as possible, policies aimed at reducing average hours of work should be pursued. Efforts to reduce working time include paid family and medical leave, paid vacations, allowing work-sharing subsidies in the unemployment insurance system, and preserving recent increases in the salary threshold below which hourly workers automatically qualify for overtime pay. To ensure that the maximum national level of aggregate demand is spread widely across regions and communities, we can use the strategic deployment of public investments like infrastructure, energy efficiency, and early child care and education. These investments are crucially important to undertake even if they result in no net new jobs at all. But their deployment can be prioritized in part based on their potential for creating jobs in communities that need them. In the jargon of macroeconomists, this means leaning more heavily on targeted fiscal policy and less on untargeted monetary policy to maintain nationally appropriate levels of aggregate demand. We need to then address remaining stubborn pockets of unemployment through targeted policies and programs, including a “public option for employment.” Once genuine full employment is achieved nationally, and once this national full employment is spread widely across the country through reduced work hours and increased public investments, there will still be pockets of unemployment remaining. To address these remaining unemployment hot spots, policymakers should begin building capacity to undertake the direct hiring of people for public service jobs that can serve as a “public option for employment.” The public-sector managerial capacity to do this at scale in the very near term is likely limited. A key priority should be building this managerial capacity up quickly. We need to focus on boosting job quality as well as quantity. Policymakers should focus on boosting job quality of both new and incumbent jobs as well as simply creating more jobs. 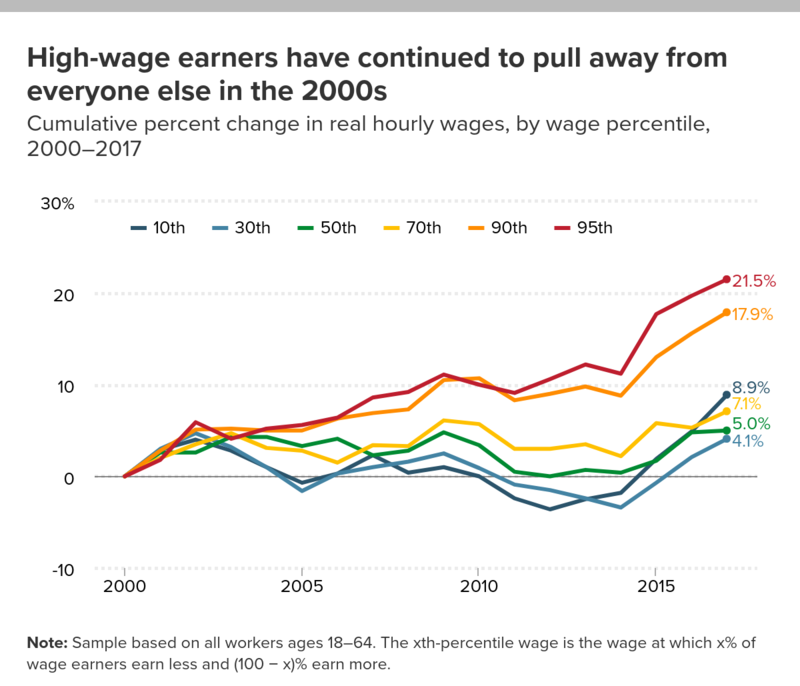 The most widespread labor market problem facing U.S. workers is near-stagnant wage growth faced by the bottom 70 percent of workers over recent decades. Solving this job quality problem will require boosting the economic leverage and bargaining power of low- and moderate-wage workers through a range of policy interventions, from targeting macroeconomic full employment to modernized labor standards to rewriting the rules governing globalization. We need to ensure that people’s basic economic security is not so tightly linked to their employment. Finally, policymakers should aim to delink some key measures of economic security from employment. For example, health and retirement benefits can be expanded through existing social insurance models (say by expanding Social Security and Medicare) rather than remaining tightly linked to particular jobs. Why don’t economies create ‘enough’ jobs? Policymakers promising to create jobs must first analyze what blockage to job growth they think is being resolved with their policy proposals. In the jargon of economists, it is useful to sort unemployment into three different types: deficient-demand, structural, and frictional. These are not perfect categories—they can occasionally be hard to define precisely, and real-world unemployment can certainly be caused or exacerbated by the overlapping of these categories. But they are a useful place to begin the discussion. What do we mean by “macroeconomic full employment”? For the vast majority of macroeconomists, full employment does not mean “everybody who wants a job gets one.” Instead, macroeconomists generally define full employment as the lowest unemployment rate consistent with nonaccelerating inflation. The reason why this definition of full employment is generally not associated with zero percent unemployment is that lower unemployment rates boost the economic leverage of workers when they bargain (collectively through a union or individually with their employer) and lead to faster wage growth. Structural unemployment happens when aggregate demand is high enough to ensure macroeconomic full employment, but either potential workers do not have the right skills to meet current employer demands in their local labor market or there are labor market frictions disproportionately faced by some particular groups of workers.4 If the only unemployment remaining in the economy were structural, and if one tried to reduce unemployment further simply by boosting aggregate demand, the only likely result would be a rise in inflation. To provide some intuition for how structural unemployment might work: imagine for a second that macroeconomic full employment has been achieved and that both imports and exports have then been increased by equivalent amounts. Workers displaced by expanding imports might not have the correct skills or might not live in the right local labor markets to be seamlessly absorbed into the expanding export industries. Over time, workers displaced from import-competing industries can move to labor markets where more jobs are available, and wages for workers employed in import-competing industries will likely fall, allowing these workers to be more easily reabsorbed into jobs. However, these processes take time. Frictional unemployment happens when aggregate demand is at a level consistent with macroeconomic full employment but there’s still churn in the labor market. People switch jobs and move all the time, and the time between jobs constitutes frictional unemployment. This switching can be involuntary (with about 1.5 million people laid off each month in the U.S. economy) or voluntary (with about 3 million people voluntarily quitting each month). If the only unemployment remaining in the economy were frictional, and policymakers tried to reduce it further simply by boosting demand, the likeliest result would be an increase in inflation, not more jobs. Further, as labor markets got tighter, while layoffs would likely decline (leading to a decline in frictional unemployment), voluntary quits would likely increase as workers would be confident that they could find at-least-as-good alternatives to their current jobs. So boosting demand would, at best, have ambiguous effects on frictional unemployment. As we note in the introduction, many economic observers would claim that the United States does not suffer nationally from deficient-demand unemployment today. They would point to the 4.1 percent unemployment rate at the end of 2017 and argue that this is beneath the lowest point reached during the pre–Great Recession business cycle of 2001–2007. However, this is likely a premature conclusion, and there is still likely potential scope to reduce joblessness by boosting the pace of aggregate demand growth today. The unemployment rate, for example, while low in historical terms, has been lower in the not-too-distant past. In 1999 and 2000, the unemployment rate averaged 4.0 percent for two full years and went below 4.0 percent for five months, and yet no wage-price inflationary spiral happened. Further, the unemployment rate lows reached during the pre–Great Recession business cycle of 2001–2007 yielded almost no real wage gains at all for the bottom 70 percent of workers, even as unemployment averaged roughly 4.4 percent by 2006 and 2007. As shown in Figure A, other labor market indicators show even more slack between today’s economy and genuine full employment. For example, the share of prime-age adults (ages 25–54) who have a job remains significantly depressed below the immediate pre–Great Recession peak and still much farther below levels it reached in 2000. Finally, wage growth seems quite subdued, running far below wage targets that would be consistent with estimates of potential productivity growth and hitting the 2 percent inflation target that guides today’s macroeconomic policymaking.5 This subdued wage growth has been a large drag on price inflation and can explain why the economy has missed the 2 percent price inflation target nearly every month of the past five years. In recent months, a number of job creation proposals have emphasized the particular labor market problems faced by historically disadvantaged groups of workers. The CAP plan, for example, highlights the challenges workers without a four-year college degree face. And, in justifying their proposal for a federal jobs guarantee, Paul, Darity, and Hamilton (2017) highlight the challenges racial minorities and ex-offenders face in the labor market. Calls to ensure that the economy hits macroeconomic full employment will strike some as too technocratic a solution to the deeply rooted institutional racism that drives many American labor market disparities. But while it is true that macroeconomic full employment is not sufficient for addressing these disparities, it is necessary. And genuine full employment is likely the single largest policy target that can help raise income and employment prospects for historically disadvantaged groups. Take the unemployment rate of African Americans as an example. It is well documented that at the macroeconomic level, this rate tends to be almost double the overall unemployment rate. This means that when recessions and downturns hit, African Americans suffer disproportionately. But it also means that recovery disproportionately improves the African American unemployment rate. Finally, it means that policies that leave the overall economy short of genuine full employment by (say) 1 percentage point will leave African Americans 2 percentage points shy of the full employment level relevant to their communities. Finally, wage growth for low- and moderate-wage workers is quite sensitive to unemployment—overall unemployment rates need to be quite low for these workers to get wage increases. Because African Americans are disproportionately represented in the bottom half of the wage distribution, as a group their wages benefit disproportionately from policies that lead to low rates of unemployment (Wilson 2015). Demand growth has been too slow to pin the economy at macroeconomic full employment for most of the past decade and for the large majority of years after 1979. This has damaged all workers and done particular harm to historically disadvantaged groups of workers. Policymakers could change this using the three major tools they have available to them for boosting demand: fiscal policy, exchange rate policy, and monetary policy. The most direct and powerful way to create jobs quickly when the economy is demand-constrained involves changes to fiscal policy—changing the level of taxes or government spending to boost aggregate demand and create more jobs. 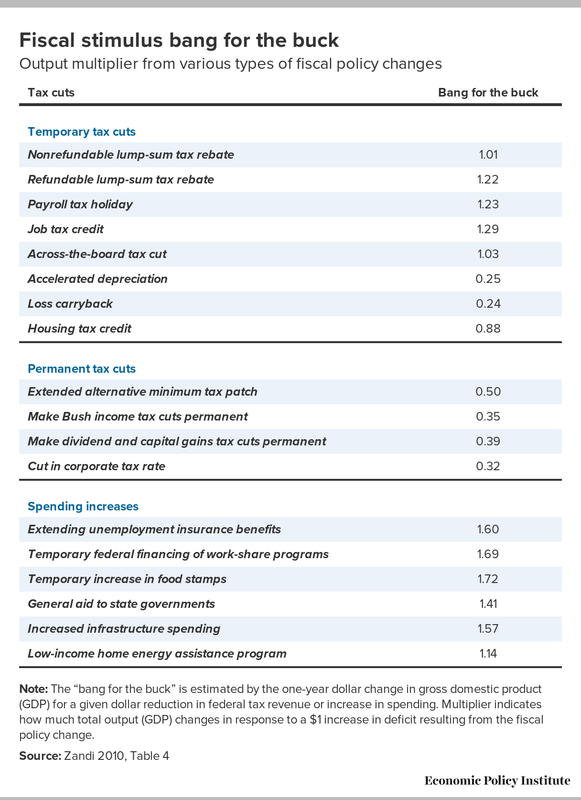 There are definitely more and less efficient ways to use fiscal policy to create jobs (see Table 1). The least efficient ways aim to boost resources for the already rich, say by cutting top tax rates and/or corporate income taxes. Delivering resources to the already rich does not induce much new spending because spending by these households is not constrained by current income. Fiscal policy changes that boost resources for low- and moderate-income households, either through refundable tax credits or transfers, will induce much more new spending, because these households’ spending is constrained by current incomes. Finally, direct government spending—for example, infrastructure investments that build roads or bridges—will boost demand directly, with no worries at all that some of the money will be saved rather than spent. Note: The “bang for the buck” is estimated by the one-year dollar change in gross domestic product (GDP) for a given dollar reduction in federal tax revenue or increase in spending. Multiplier indicates how much total output (GDP) changes in response to a $1 increase in deficit resulting from the fiscal policy change. Some key virtues of fiscal policy changes as job creation strategies are simply that they work more effectively and directly than other policy changes and can be much more precisely targeted than other types of aggregate demand boosts. This targeting will become key in our later recommendations. Another important lever to keep aggregate demand strong and to boost job growth is exchange rate policy that keeps trade balanced—making sure that jobs displaced by imports are matched by jobs gained by exports. When the dollar’s value rises, U.S. exports become more expensive on world markets and global imports become cheaper for American consumers. This leads to exports falling and imports rising, and the resulting rise in the trade deficit means that the number of jobs sustained by exports falls while the number of jobs displaced by imports rises. In theory, the shortfall of jobs stemming from trade flows could be soaked up by healthy job growth in the nontraded sector. But when the overall economy is constrained by too-slow growth in aggregate demand, a trade deficit is just another drag on this demand and jobs displaced by trade are net losses to the economy at large. The chronic trade deficits run by the U.S. in recent decades are prima facie evidence that the dollar’s value remains too high; policy efforts to allow it to fall to more competitive levels could create jobs. This means that when it comes to spurring economic growth, the Fed’s key role is intentional inaction on interest rates. By not raising rates, they allow the economy’s growth to continue unabated. In times when this growth is too slow, this obviously provides very little boost. But during times when this growth has been healthy (as in the late 1990s), Fed forbearance on raising rates has allowed for rapid growth. Because monetary policy can effectively slow growth, and because the Fed is autonomous and fast-moving relative to other policymakers, the Fed essentially has veto power over efforts to spur aggregate demand growth through other policy changes. If, for example, Congress and the president passed a large package of tax cuts and spending increases to boost the economy, but the Fed thought the economy had already reached full employment or that such fiscal moves threatened to raise inflation, the Fed could block the effects of these tax cuts and spending increases with interest rate hikes. They have certainly done so in the past, most notably in the early 1980s. Is it completely worthless to advocate for, say, fiscal boosts if we expect the Fed to neutralize their overall impact with interest rate increases? Not necessarily. If, for example, a fiscal boost took the form of well-targeted measures to either boost public investment or raise the resources available to low- and moderate-income households, the gains to economic efficiency or to distributional fairness might make these efforts worth doing even if the Fed held their impact on overall job creation neutral.9 But those claiming to be in favor of strong job creation measures in coming years must take debates surrounding the Fed and macroeconomic definitions of full employment as seriously as they take the task of coming up with nonmonetary policy solutions. Is there a role for job creation policies once macroeconomic full employment is reached nationally? Once the national labor market has reached genuine full employment, strong policy imperatives will still be needed to ensure that as many willing workers as possible can find work. Two stand out. First, public policy can help ensure that national full employment is widely spread across communities, defined by both geography and demography. Second, public policy can also help address frictional and structural unemployment. Importantly, full employment nationally likely means some regions are overfull and some are underfull. There are welfare gains to be had by distributing aggregate demand more equally over regions and across communities. Take an example where the national economy consists of two regions—let’s call them Luckyland and Cursedville. Each region has 50 percent of the workforce. Say that the national unemployment rate is at macroeconomic full employment at 4 percent; however, in Luckyland the unemployment rate is 2 percent while in Cursedville it is 6 percent. Say that inflation is 3 percent in Luckyland (the economy there is hot, remember), while it is running at just 1 percent in more-depressed Cursedville. What happens if we try to boost aggregate demand nationally, say with monetary policy that just sees the Fed reducing national interest rates by some measure? In this scenario, we would likely see national unemployment pushed down below full employment. Say that Luckyland unemployment rates fall to 1 percent while Cursedville unemployment rates fall to 5 percent, leading to national unemployment of 3 percent—below macroeconomic full employment. But pushing national unemployment below macroeconomic full employment would push inflation above policymakers’ targets. The Fed would not allow this—they would never actually cut interest rates given starting conditions of national full employment—and yet excess unemployment in Cursedville remains. But can we instead somehow compress unemployment differentials across communities and make sure everybody is closer to the national rate of unemployment when we’re at national macroeconomic full employment? We could; an obvious strategy would be a mix of more expansionary fiscal policy—targeted at specific communities—and less monetary stimulus (i.e., higher interest rates). As the fiscal stimulus could be targeted, while the monetary contraction would be more diffuse, we could almost certainly iron out differences in labor market conditions stemming from the distribution of aggregate demand across communities. Further, we can also make a given amount of aggregate demand either more labor-intensive, or less hours-intensive, by dividing a set amount of aggregate demand into more jobs. For example, a job-creation tax credit induces employers to hire more workers per unit of output.10 A job-sharing tax credit, or even mandated shorter workweeks, makes a given tranche of aggregate demand get spread over a larger group of workers working fewer hours (see Baker 2011 for a fuller explanation). As we noted previously, frictional unemployment happens when aggregate demand is at a level consistent with full employment but there’s still churn in the labor market. Structural unemployment happens when aggregate demand is high enough to ensure national full employment but labor market frictions keep unemployed workers from finding a good match with potential employers. These states of frictional and structural unemployment are potentially ameliorable by smart policy decisions. For example, investments that improve geographic mobility (i.e., cheap and efficient mass transit) might provide a larger menu of potential jobs to job seekers who don’t currently have easy access to transportation. This larger menu of possible jobs could lead to better matches between jobs and workers and lead to less turnover and hence reduce the length of nonemployment spells. Proposals to help workers obtain better training or education can help lower structural unemployment by providing skills that may be more in demand in their local labor markets. A similar role can be played by active labor market policies and wage subsidies that entice employers to hire workers they might not otherwise hire. Job supports like child care that allow people to work can also remove key barriers between potential workers and employers. With this analysis in hand, we can sketch out how policymakers should approach thinking about a strategy for jobs. By far the most important task for producing robust job creation is ensuring that job growth is not being strangled by too-slow growth in aggregate demand. We largely failed at this task for most years since 2000 and for substantial parts of preceding decades. While deficient demand is no longer an emergent crisis today in the way that it was in the immediate aftermath of the Great Recession, there potentially remains demand slack in the U.S. economy even today. Fiscal policy that boosts public investments could generate enough aggregate demand nationally to push the economy to macroeconomic full employment. Further, if deployed at a large enough scale and strategically, such investments could also iron out differences in unemployment rates between communities that result from uneven patterns of aggregate demand growth, a possibility we explore in the next section of the paper. Further, large-scale public investments could maintain macroeconomic full employment nationally and iron out intercommunity differences even if (as expected) the Federal Reserve pulled back monetary stimulus to the economy in response. However, to ensure that genuine macroeconomic full employment is achieved, the Federal Reserve must be convinced to allow it to happen. Otherwise the jobs created through fiscal measures will be largely offset by jobs lost when the Fed raises interest rates in response. The resulting pattern of employment may still be preferable on efficiency or distributional grounds from a fiscal stimulus paired with monetary contraction, but it will not create jobs on net. This is not a problem of insufficient political ambition or cleverness in design. Too many in the job creation debate have put forward proposals that ignore the role of the Fed. The reasoning seems to be that working to widen the box of potential labor market outcomes the Fed will tolerate is playing “small-ball,” and more ambitious proposals can somehow sidestep the Fed’s veto. But they can’t—the problem of the Fed’s veto must be solved head-on. For example, even the largest fiscal stimulus meant to create jobs could be neutralized by a Fed determined to keep it from leading to durably lower unemployment in the name of restraining inflation. Another key reason to lock in macroeconomic full employment as the first step in job creation is that we cannot actually know how big the problems of regional disparities or frictional or structural unemployment are until we get to actual full employment nationally. In a blockbuster study of job training in France, Crepon et al. (2013) showed that unless economies were in full employment, training programs just led to pure displacement—arming one set of workers with better training in a game of musical chairs so that they could defeat other workers. While achieving a level of aggregate demand consistent with national full employment would be a crucial first step to addressing many concerns about jobs, policymakers can do even better than this by ensuring that the jobs created by national full employment are spread as widely as possible across workers, regions, and communities. The key ways to do this are to reduce working time and to deploy public investments in ways that do not just provide necessary outputs, but also iron out labor market disparities between regions. Further, while most other advanced economies have taken some of recent decades’ gains in productivity in the form of more leisure, the United States is exceptional in how little working time has been reduced. Figure B shows the average hours worked in the U.S. compared with the overall average for members of the Organisation for Economic Co-operation and Development (OECD) (which are generally among the wealthiest nations in the world). 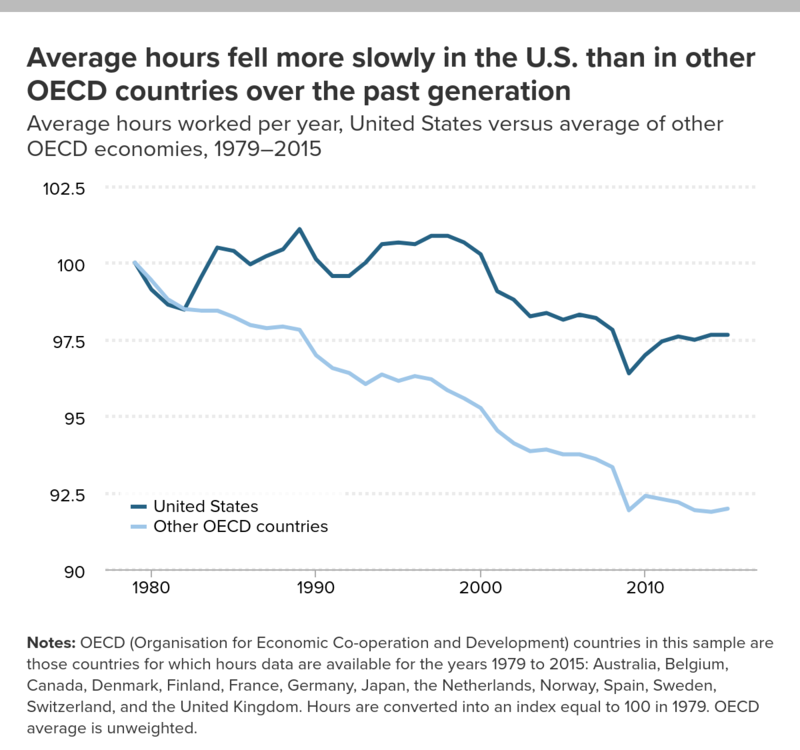 Since 1979, hours on average across the OECD are down by 9 percent, while in the U.S. they are down by just over 2 percent. Notes: OECD (Organisation for Economic Co-operation and Development) countries in this sample are those countries for which hours data are available for the years 1979 to 2015: Australia, Belgium, Canada, Denmark, Finland, France, Germany, Japan, the Netherlands, Norway, Spain, Sweden, Switzerland, and the United Kingdom. Hours are converted into an index equal to 100 in 1979. OECD average is unweighted. 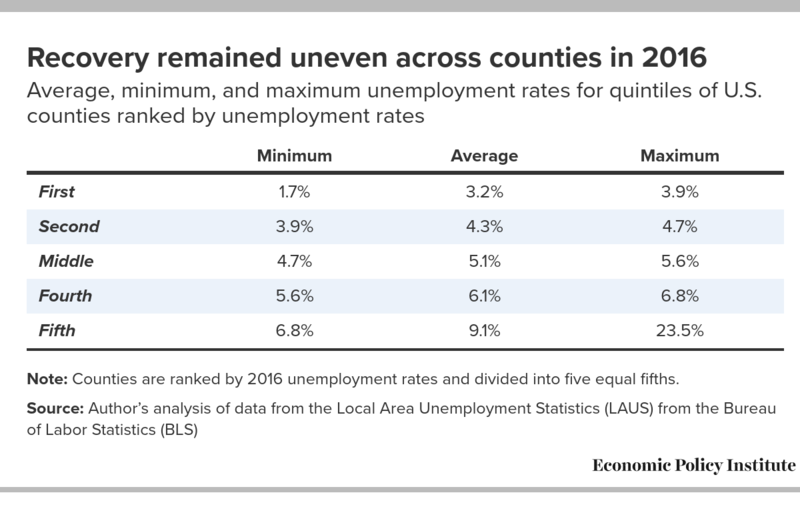 Note: Counties are ranked by 2016 unemployment rates and divided into five equal fifths. This means that we can deploy these public investments strategically to communities and regions, with particularly depressed labor markets gaining priority. Luckily for planning reasons (if not for the residents of these communities), distressed labor markets and more pressing need for public investments’ outputs are likely to go hand in hand. Flint, Michigan, for example, would benefit enormously from both the lead-free water and the job boosts that would come from a truly ambitious plan to replace water pipes in that community. Relatedly, most proposals to provide public aid to ensure quality early child care and education link this aid to income levels, so the benefits would flow naturally to poorer communities. Besides targeting specific geographic areas, an additional tranche of federal investments could target funds in an effort to address long-term labor market distress of particular communities within geographic areas. For example, while the unemployment rate for a particular metropolitan area may be low, there may well be communities—say, young African American men—within the metro area that still suffer from high unemployment. This is not just idle speculation; the city of Seattle in 2016 had average unemployment of 4.0 percent (substantially below the national average of 4.9 percent over that year) and had seen wage growth of over 19 percent in the previous two years (compared with national wage growth of less than 5 percent). Yet in Washington State as a whole, youth unemployment (among workers ages 15–24) was 12.3 percent, well above the national rate of 10.4 percent. If infrastructure projects could be specifically identified that would well-target high rates of joblessness in specific communities, it could do much good, even if aggregate demand generated in these communities were counterbalanced by lower levels of demand in some others. It seems clear that a sustained increase in the overall level of public investment (both traditional infrastructure as well as noncore investments that nevertheless will yield high returns—such as early childhood education) could go a long way toward ironing out community disparities in unemployment, even when the national labor market is healthy. In economists’ thinking, a more expansive but better targeted fiscal policy could shoulder more of the load in job creation than monetary policy stimulus. Ensuring macroeconomic full employment nationally, reducing working time, and using strategic deployment of public investments to iron out regional disparities in deficient-demand unemployment will likely get us a long way toward making the nation’s job market much healthier. But telling potential workers who still cannot find work that we cannot do anything more because their joblessness is just frictional or structural is not sufficient. Frictional and structural unemployment sound bloodless enough on paper, but they are often the legacy of discriminatory labor market practices (either in the present or the past), horribly unequal access to quality education, past failures to keep the national economy at full employment that led to the “last hired, first fired” dynamic that sidelined people for extended periods through no fault of their own, unequal access to neighborhoods that are richer in job opportunities, and employer practices that make low-wage work irregular and inadequate to provide a decent living. For all of these reasons, we should start thinking hard about how to put a dent in frictional or structural unemployment and provide help in job-finding to those still suffering even after full employment and strategic deployment of stepped-up public investments across communities has happened. Generally, policy discussions aimed at reducing structural or frictional unemployment hop directly to improving workers’ skills. This is a worthy goal; the U.S. has never done skill development (whether private or publicly directed) particularly well, so any intervention that can genuinely boost skills is welcome. However, in recent years persistent claims that deficient skills are the primary barrier between willing workers and jobs have not been supported by careful data.18 This means that skills development should not obviously jump to the head of the list of policies meant to reduce structural or frictional unemployment. Even at full employment, the frictions keeping willing workers and jobs apart might not be purely skill-based, and there may be low-hanging fruit in terms of policies that could make a given level of aggregate demand generate more jobs. Two possibilities worth discussing are efforts to reduce working time (discussed in the previous section), and direct public job creation schemes (such as proposals to provide a public option for employment, discussed below). By providing a public option for employment (POE), the government becomes an “employer of last resort” for job seekers who are otherwise unable to find work in the private sector or through existing public structures. Generally, POE proposals are envisioned as providing a tranche of public money to states and localities to provide a steady buffer of jobs to those willing workers who remain locked out of work even after best practice in job creation policy has been followed. These jobs could be publicly managed, or they could support work in the nonprofit sector. A characteristic feature of POE proposals, as opposed to jobs created through public investment in areas like infrastructure or child care, is that the job matters more than the output. The purpose of a POE program is primarily to provide a job and only secondarily to specify a pressing social need that will be addressed by this employment. This means something quite important about these programs: the jobs associated with POE programs must be jobs that society is fine seeing go unfulfilled when the economy heats up and the private sector pulls people into employment from the public sector. While POE programs have much to recommend them, they likely cannot be a job creation panacea, at least not in the near term. Because POE jobs would swell and ebb radically over the course of the economic cycle if they were our primary way of absorbing demand shortfalls, they should be jobs that society is fine having go unfulfilled during periods of labor market health. This would seemingly rule out many jobs commonly associated with POE programs, like jobs in the early child care sector. Early child care jobs are vital public investments that require consistent effort put forward by well-credentialed professionals; they are not jobs that society would be fine living without for a stretch. Because POE jobs should be ones society is fine doing without during stretches of economic strength, the universe of jobs that could be created and managed under a POE program is hence limited. But for all the cautions raised above, POE jobs are potentially promising as a way to deal with some of the joblessness remaining after issues of aggregate demand—both nationally and across communities—have been solved. A promising way to start is to ramp up the youth employment programs that currently exist. Pollack (2017) surveys the evidence on existing youth job creation programs (mostly summer employment programs) and finds promising results. He raises valid concerns about the quality of implementation in these programs that should inform all POE-type proposals. While politicians are rightly concerned about alleviating job market distress for Americans, they should not just focus on creating new jobs. They need to also stress improving the quality of jobs, both new and incumbent. After all, the vast majority of American job seekers find work before too long. But for the vast majority, the returns to this work have risen agonizingly slowly over decades, with wages for the bottom 70 percent of the workforce near-stagnant (growing less than 0.5 percent annually) since 1979, as seen in Figure C. In addition to wage stagnation, employer-provided benefit provision has also stagnated or even declined in recent decades.21 Other measures of job quality—from regular schedules to having fair access to dispute settlement procedures—could also be improved. Note: Sample based on all workers ages 18–64. The xth-percentile wage is the wage at which x% of wage earners earn less and (100 − x)% earn more. Finally, we would be remiss if we didn’t point out that one of the reasons Americans are so anxious about jobs is that so much of their economic security is bundled with their employment. Some of this is obviously inevitable; the vast majority of nonelderly Americans get the vast majority of their income—as well as their health insurance—from working. Even older Americans’ income sources—Social Security and pensions—are legacies from their past working lives. But policy can delink some of the economic security from employment and active job-search. Unemployment insurance, for example, could be made more generous and easier to qualify for. Or affordable health care could be made easier to obtain for nonelderly Americans who don’t have jobs. The Affordable Care Act has made an excellent first step in this regard, and the health care guarantee could be further improved. Expanding Social Security could help beef up retirement incomes and increase retirement certainty even for those workers who did not have consistently well-remunerated employment during their working-age lives. Efforts to make college more affordable can relieve some stress from parents who go jobless for spells. In the end, work will still have to provide the bulk of Americans’ income and economic security, but policy can certainly aid in those times when work is scarce and can protect those workers who are subject to labor market dysfunction that is beyond their control. Policymakers should move quickly to make the job market better for Americans. However, they should also move forward with a clear idea of what they are trying to fix and how the policies they propose would fix it. Bold solutions are needed, but they have to be the right bold solutions, and there is no one single silver bullet that will slay the problem of labor market distress for all Americans. Instead, a portfolio of policies is needed to restore macroeconomic health and correct the profound power imbalance between workers and their employers that has emerged in recent decades. 1. Among economists, this type of unemployment is more commonly called Keynesian unemployment, after the economist who first fully specified how deficient-demand unemployment could persist. But in the name of reducing jargon and making this a more descriptive label, we will call it deficient-demand unemployment here. 2. Among economists, this is generally just shorthanded as “full employment.” But because many lay readers might interpret full employment to imply zero unemployment, we keep the macroeconomic qualifier here to signal that we are using a precise and technical definition. 3. The ever-accelerating inflation that begins before the economy hits zero percent unemployment is why macroeconomists are comfortable calling this nonzero unemployment rate “full employment.” Essentially, it is the lowest sustainable level of unemployment if one makes the (generally sensible) assumption that ever-accelerating inflation rates are not sustainable. Later in this paper, we identify ways in which today’s unemployment rate might be misleading as a measure of the true slack remaining in American labor markets. However, because the unemployment rate is the most commonly known measure of labor market health to lay readers, we frame much of the discussion in what follows in terms of unemployment. Further, if the economy hit a very low unemployment rate for an extended period (say 4 percent for two years, similar to what happened in 1999 and 2000), we are quite confident that other measures of labor market slack would tighten up considerably. 4. For example, low-wage workers might have trouble finding employment because they have limited transportation options and can therefore only job-search within a very limited geographical area. 5. The question of whether the 2 percent inflation target is appropriate or not is an important one, but for the purposes of this paper we take this target as given. Even if one thinks it’s too conservative a target, it remains the case that the economy has repeatedly undershot this target in recent years. The case for nonzero inflation targets and the case for nominal wage growth targets consistent with price targets can be found in Bivens 2017 and Bivens 2015, respectively. 6. Some fiscal stabilization policies, however, do not require legislation in order to kick in during recessions. So-called “automatic stabilizers”—such as progressive taxation, unemployment insurance, and means-tested income support and social insurance programs—all mechanically transfer resources to households as private-sector incomes fall. 7. While this asymmetry of effects of interest rate policy (rate cuts do not spur growth much, but rate increases reliably tamp growth down) has been known for decades, it has received crucial recent rigorous confirmation in a paper by Angrist, Jorda, and Kuersteiner (2013). 8. Bivens (2014) provides a quick overview of the arguments surrounding the Fed and full employment. 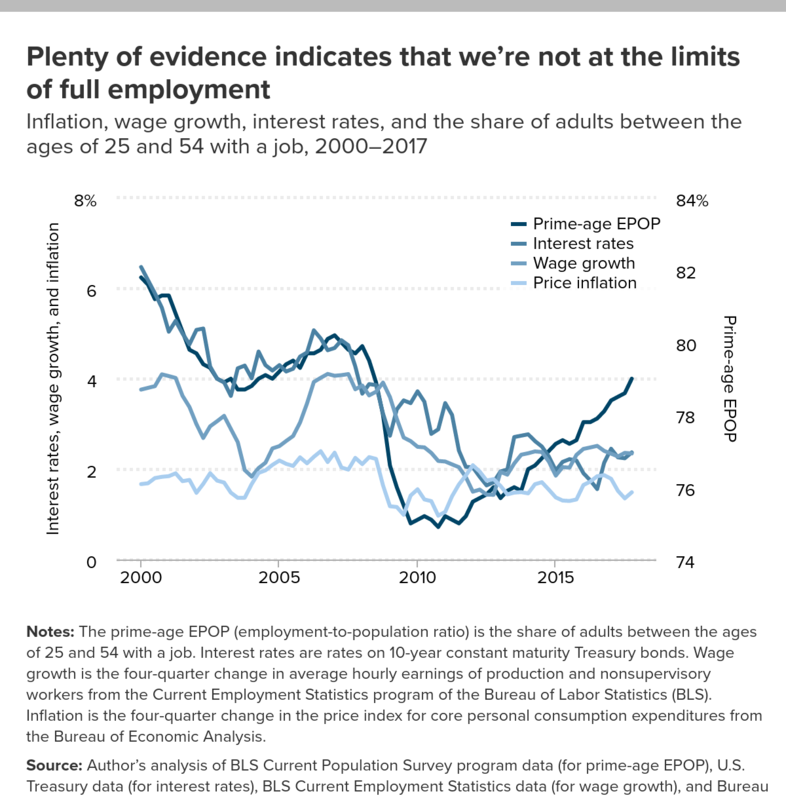 We should note that EPI practices what we preach: EPI is a key member of the Fed Up coalition, which exists precisely to focus lots of attention and resources on convincing the Fed to be more aggressive in pushing the economy to full employment. 9. The next section also notes a role for tighter monetary policy and more expansionary fiscal policy that is targeted as a way to ensure that the jobs generated by macroeconomic full employment are spread as widely as possible across communities. 10. Essentially, as Bishop and Bartik (2009) demonstrate, the job-creation tax credit induces employers to use more labor and less capital (and other inputs) for producing a given amount of output. So, a fast-food restaurant thinking of investing in kiosks might instead hire an extra cashier should a job-creation tax credit be offered to them. 11. Some might naturally ask if providing federal funds to directly hire workers does not just constitute fiscal expansion aimed at boosting aggregate demand. We think this strategy can be reasonably well distinguished from simple fiscal demand management, however. For one, the direct employment generation could be financed by tax increases that reduce aggregate demand. For another, while the goods and services that most direct employment proposals envision being produced clearly boost living standards and quality of life, they may well not boost measured gross domestic product (think community beautification, for example). Finally, Tcherneva (2012) argues that direct employment program wages could be set below market wages, hence providing no upward pressure on wage growth that would result in inflationary pressures. 12. In terms of absorbing job losses from recessions, the research on work-sharing is clear—see Baker 2011. Hunt (1999) examines the longer-run effects of reduced work hours on Germany’s economy. She finds modest employment gains. 13. Goldin (2014) highlights that extremely long weekly hours at the top of the earnings distribution are strongly associated with the failure to close gender wage gaps at the top of the earnings distribution. She recommends business and organizational changes to reduce these long hours, which she argues disproportionately advantage male workers. 14. Gould et al. (2015) show that boosting hours back to levels consistent with the full-employment-ish economy of 2000 would reduce nonelderly poverty by 1.6 percentage points. 15. The overtime rule is currently in some legal uncertainty and has not been enforced yet. 16. Infrastructure projects are often assumed to be undersupplied by private markets because of their natural monopoly characteristics (large upfront costs and low marginal costs). Bivens et al. (2016) point out that low- and moderate-income families may well have trouble affording high-quality early child care and education, yet the returns to investing in this are large enough (including substantial spillovers) that federal aid in making such high-quality programs affordable is clear efficiency-generating in the long run. 17. The view of job creation as a pure transfer rests on a very stylized model of labor markets—wherein these markets are perfectly competitive: workers can always instantly find alternative employment should they lose a job, and employers can always find a perfect substitute instantly for any worker that quits. But if instead the labor market has frictions that make good “matches” between workers and jobs valuable, then job creation can result in societal benefits and not just represent a pure transfer. 18. For serious evaluation of skills-shortage claims, see Burtless 2014, Cappelli 2015, Mishel 2011, Shierholz 2013, and Weaver and Osterman 2017. Of course, skills shortages are highly dependent on the state of the business cycle, so some of these analyses might change with the most up-to-date data, but given that we hear loud claims of shortages throughout the business cycle, the default position should be skepticism that shortages exist. Such admirable skepticism was recently expressed by the president of the Federal Reserve Bank of Minnesota, Neel Kashkari, when he remarked to a conference of employers, “If you’re not raising wages, then it just sounds like whining” (da Costa 2017). It’s worth noting that there is no evidence—even in the most recent data—of economywide upward pressure that would be consistent with skills shortages being a primary driver of economic trends. 19. Outright recessions should be fought with much larger automatic stabilizers (programs like unemployment insurance and food stamps—which ramp up spending through formulas and eligibility requirements rather than having to wait on new legislation—as well as progressive taxes that give people tax cuts automatically when their annual income falls), combined with greater automaticity in the aid to state and local governments that was so effective during the Great Recession. For example, when the American Recovery and Reinvestment Act (ARRA) picked up state Medicaid bills for two years and ramped up highway spending, state and local spending did not drag on growth. As soon as the ARRA provisions faded, the state and local government sector became a historically large drag on growth. If we are determined to get creative with large-scale solutions to fight recessions, we can also figure out new ways to enact large transfers to households—either through tax cuts or with new institutions that allow the Fed to issue “helicopter money” (see Blyth and Lonergan 2014 for a discussion of this). 20. This number is obviously plucked from the air. But if a POE program actually managed to see 10,000 workers hired on average in each of the 100 largest cities in the United States, I think one would have to consider that a huge success. 21. See Mishel et al. 2012 for evidence on the erosion of employer-provided benefits to the bottom half of the workforce. 22. See EPI 2016 for an agenda to boost workers’ pay through creating robust labor standards and institutions that aid workers’ leverage, as well as efforts to provide a directly countervailing force to the economic power of the top 1 percent. Angrist, Joshua, Òscar Jordà, and Guido Kuersteiner. 2013. “Semiparametric Estimates of Monetary Policy Effects: String Theory Revisited.” San Francisco Federal Reserve Board Working Paper 2013-24. Baker, Dean. 2011. “Work Sharing: The Quick Route Back to Full Employment.” Center for Economic and Policy Research. Bishop, John, and Timothy Bartik. 2009. The Job Creation Tax Credit: Dismal Projections for Employment Call for a Quick, Efficient, and Effective Response. Economic Policy Institute Briefing Paper no. 248. Bivens, Josh. 2014. “The Federal Reserve, Full Employment, and Financial Stability.” Working Economics (Economic Policy Institute blog), May 28. Bivens, Josh. 2015. A Vital Dashboard Indicator for Monetary Policy: Nominal Wage Targets. Policy Futures project, Center on Budget and Policy Priorities. Bivens, Josh. 2017. Is 2 Percent Too Low? : Rethinking the Fed’s Arbitrary Inflation Target to Avoid Another Great Recession. Economic Policy Institute. Bivens, Josh, Emma García, Elise Gould, Elaine Weiss, and Valerie Wilson. 2016. It’s Time for an Ambitious National Investment in America’s Children: Investments in Early Childhood Care and Education Would Have Enormous Benefits for Children, Families, Society, and the Economy. Economic Policy Institute. Blyth, Mark, and Eric Lonergan. 2014. “Print Less but Transfer More: Why Central Banks Should Give Money Directly to the People.” Foreign Affairs September/October. Bureau of Economic Analysis. Various years. National Income and Product Accounts [data tables]. Bureau of Labor Statistics. Various years. Current Employment Statistics (CES) [public data series]. Data from the CES are available through the CES National Databases and through series reports. Bureau of Labor Statistics. Various years. Current Population Survey (CPS) [public data series]. Aggregate data from basic monthly CPS microdata are available through three primary channels: as Historical ‘A’ Tables released with the BLS Employment Situation Summary, through the Labor Force Statistics database, and through series reports. Bureau of Labor Statistics. Various years. Local Area Unemployment Statistics (LAUS) program. Data from the LAUS are available through the LAUS database and through series reports. Burtless, Gary. 2014. “Unemployment and the ‘Skills Mismatch’ Story: Overblown and Unpersuasive” (op-ed). Brookings Institution website, July 29. Cappelli, Peter. 2015. “Skill Gaps, Skill Shortages, and Skill Mismatches: Evidence and Arguments for the United States.” Industrial and Labor Relations Review vol. 68, no. 2, 251–290. Crépon, Bruno, Esther Duflo, Marc Gurgand, Roland Rathelot, and Philippe Zamora. 2013. “Do Labor Market Policies Have Displacement Effects? Evidence from a Clustered Randomized Experiment.” Quarterly Journal of Economics vol. 128, no. 2, 531–580. Da Costa, Pedro. 2017. “Fed Rebel Warns Businesses to Stop ‘Whining’ about a Shortage of Workers.” Business Insider, August 8. Economic Policy Institute (EPI). 2016. The Agenda to Raise America’s Pay. Goldin, Claudia. 2014. “A Grand Gender Convergence: Its Last Chapter.” American Economic Review vol. 104, no. 4, 1091–1119. Gould, Elise, Alyssa Davis, and Will Kimball. 2015. Broad-Based Wage Growth Is a Key Tool in the Fight Against Poverty. Economic Policy Institute. Hunt, Jennifer. 1999. “Has Work-Sharing Worked in Germany?” Quarterly Journal of Economics vol. 114, no. 1, 117–148. Mishel, Lawrence. 2011. Education Is Not the Cure for High Unemployment or for Income Inequality. Economic Policy Institute Briefing Paper no. 286. Mishel, Lawrence, Josh Bivens, Elise Gould, and Heidi Shierholz. 2012. The State of Working America, 12th Edition, An Economic Policy Institute Book. Ithaca, N.Y.: Cornell Univ. Press. Organisation for Economic Co-operation and Development (OECD). 2017. Average Annual Hours Actually Worked per Worker [data series]. OECD.Stat online database. Accessed October 2017 at https://stats.oecd.org/Index.aspx?DataSetCode=ANHRS. Paul, Mark, William Darity Jr., and Darrick Hamilton. 2017. “Why We Need a Federal Job Guarantee.” Jacobin, February 4. Pollack, Harold. 2017. Full Employment for the Young, Too: Well-Designed Job Programs Can Usher Teens and Young Adults into the Labor Market. Policy Futures project, Center on Budget and Policy Priorities. Shierholz, Heidi. 2013. “Is There Really a Shortage of Skilled Workers?” In Restoring Shared Prosperity: A Policy Agenda from Leading Keynesian Economists, Thomas I. Palley and Gustav A. Horn, eds. Spross, Jeff. 2017. “You’re Hired!” Democracy: A Journal of Ideas, Spring, no. 44. Tanden, Neera, Carmel Martin, Marc Jarsulic, Brendan Duke, Ben Olinksy, Melissa Boteach, John Halpin, Ruy Teixeira, and Rob Griffin. 2017. Toward a Marshall Plan for America: Rebuilding Our Towns, Cities, and the Middle Class. Center for American Progress. Tcherneva, Pavlina R. 2012. “Beyond Full Employment: The Employer of Last Resort as an Institution for Change.” Levy Economics Institute Working Paper no. 732. U.S. Department of the Treasury. “Daily Treasury Yield Curve Rates” [data table]. Accessed March 22, 2018, at www.treasury.gov. Weaver, Andrew, and Paul Osterman. 2017. “Skill Demands and Mismatch in U.S. Manufacturing.” Industrial and Labor Relations Review vol. 70, no. 2, 275–307. Wilson, Valerie. 2015. “The Impact of Full Employment on African American Employment and Wages.” Paper written for the Full Employment Project at the Center on Budget and Policy Priorities. Wilson, Valerie, and Janelle Jones. 2018. Working Harder or Finding It Harder to Work: Demographic Trends in Annual Work Hours Show an Increasingly Fractured Workforce. Economic Policy Institute. Zandi, Mark. 2010. The Economic Impact of Tax Cut Proposals: A Prudent Middle Course. Moody’s Analytics.